Ovation Mandolin | Gear Acquisition Syndrome!! 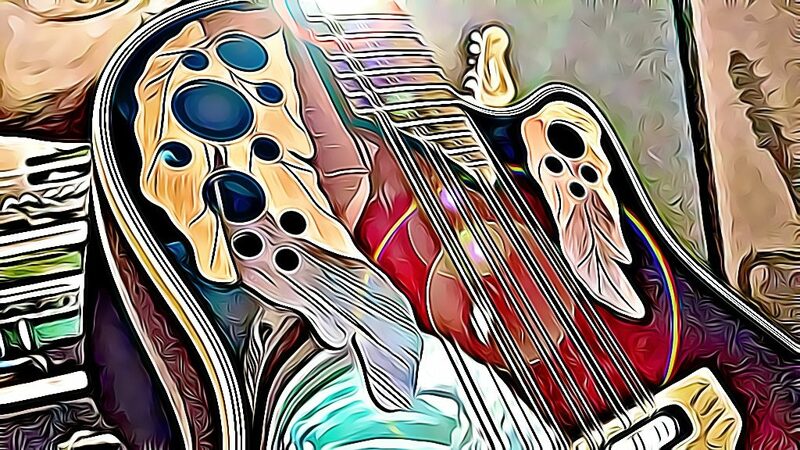 My Ovation Mandolin – Gettin’ Jiggy With It! The lights dimmed. It was time to play. The music lit the place up like dynamite! We were stringing together some energetic IRISH JIGS, and my EVH amp, on the Crunch channel, was giving my speeding notes frolicking flight. But I wasn’t playing a guitar. Nope. I was playing my Ovation Mandolin!! Some walk up after concerts and ask me about “that little guitar” I played. 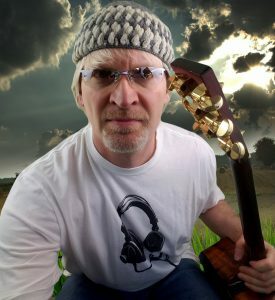 If I’m not incorporating my ACTUAL little guitar (see THIS ARTICLE for that beauty), then they’re talking about my mandolin. If you’re unfamiliar with mandolins, let me first tell you how much FUN they are. It’s like mixing the smiling sound of a ukulele with the steel bite and technique of a Telecaster. Most of the time you’re doing upbeat runs, melodies and hyper-energized strummings on a mandolin, so there’s no lack of fast-paced inspiration when you pick one up! The mandolin is tuned, bottom note to top note, to G, D, A, E. It’s the exact same tuning as a violin, so if you play fiddle, you already know where all the notes are! 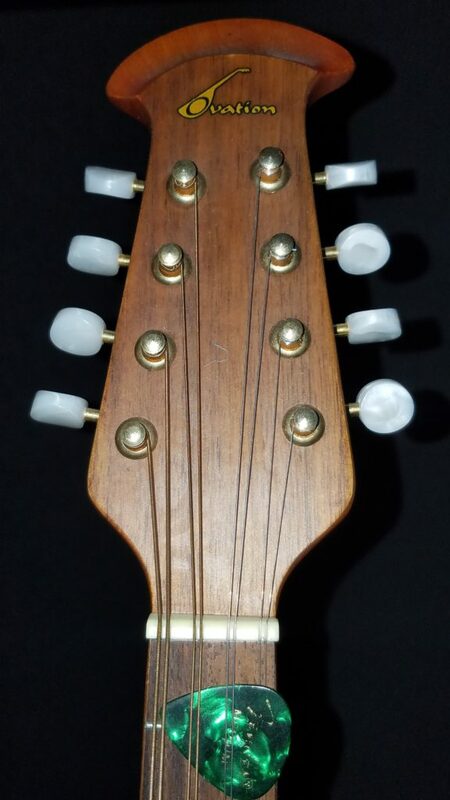 A typical wooden, NON-Ovation mandolin. For guitarists, mandolin isn’t that hard to play either. 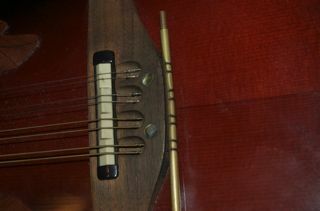 The open strings are the four bottom strings on a guitar, but set in reverse, and going UP in pitch instead of down. Because of that, you already know the guitar chord shapes – they’re just backward and using only four strings out of six. But wait! Doesn’t mandolin have EIGHT strings?? Yes, but four of ’em are just doubling strings, the same approach the 12-string guitar takes. So, really, when you’re playing, you’re only thinking about 4 strings to chord, solo, etc. The ‘Applause‘ instruments I don’t typically recommend, except for absolute beginners. They come across a bit cheap to me… which, of course… they ARE. That’s the point; Ovation wants to give people with little cash an option, so if it’s a new musical step and you don’t want to spend a bundle then, sure… go ahead. The ‘Celebrity‘ instruments are good, well-made instruments. They’re constructed to the same fundamental specs & design characteristics as the more costly MCS68 mandolins. They’re just built overseas instead of here in America. Now, getting an “Imported instrument” used to mean a huge dive in quality decades ago, but that’s really not very true these days. Thank China’s booming economy and openness to finally learn from Capitalism in recent years. I’ve played many a fine Chinese instrument in the last 7 years especially. So you get a good instrument with a price that reflects a foreign point of origin. The ‘MM68‘ instruments are as forgiving as tanks, and just keep dishing out great sound stage after stage, all while looking fairly fancy since they have all the upper-crust accouterments that you’re paying extra for. They got the bling, dawg! So, how does my Celebrity fit in the mix?? Well, I have owned the Ovation MCS148-RRB ‘Celebrity’ Mandolin for about 5 years now. The ‘RRB‘ stands for “Ruby Red Burst“, which is the color and finish that first drew me to the instrument. 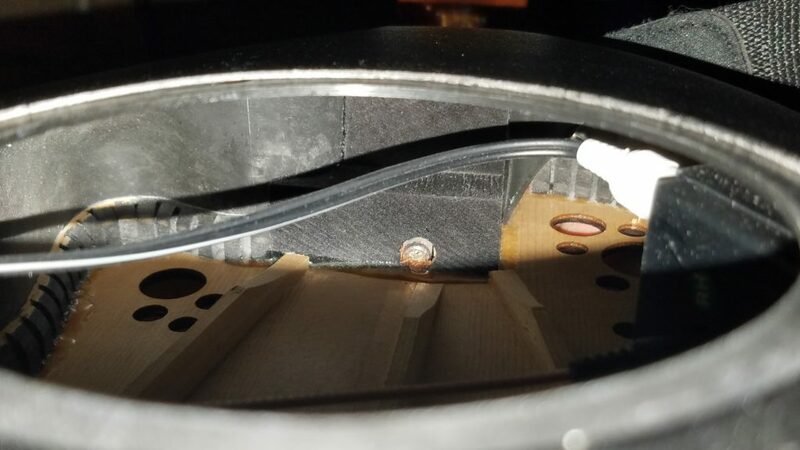 The truss rod is visible inside! Same specs, and same beautiful craftsmanship as the top models?? I think I want a SECOND one!! 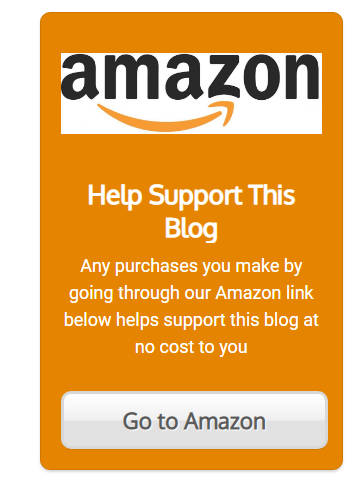 But… but… it’s not WOOD??!! I am not unaware of many people’s derogatory opinion of Ovation instruments. They are the wood purists; the handmade carpenters champions; the ‘proud-to-be-a-Luddite’ picketers. Hey, not everybody embraces change. I get it. The back cover gives access for battery changes. Ovation instruments, however, have many, many good reasons to put them in your musical arsenal. But, for me, there IS one reasonable reason why I would NOT choose my Ovation mandolin, or my Ovation guitar, to play. Know what it is? 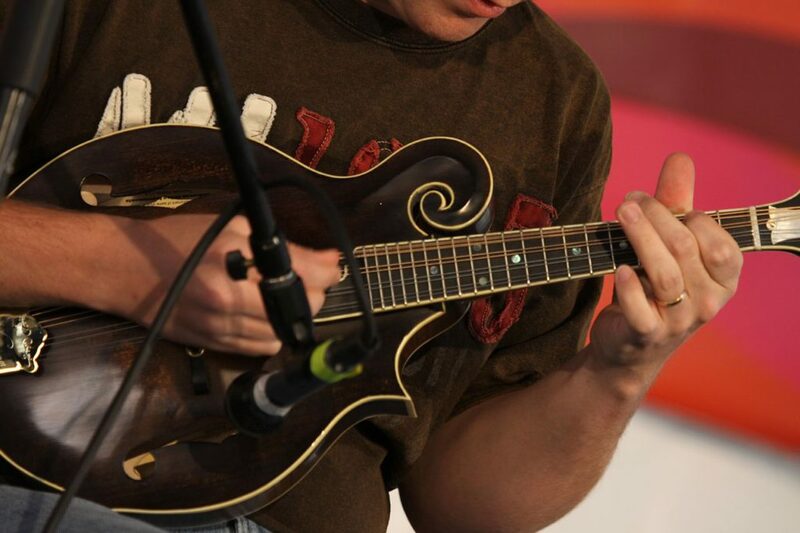 I also have a mandolin that was made in the late 1800s. It has, uh, NO plastic parts. It’s all wood, baby. Wood, wood, WOOD! With a few ivory tuner pegs thrown in just to make P.E.T.A. mad. But it has a certain sound. Its tonality is, as we’d expect, very WOOD-sounding. When I play it, I think of the hills of Tennessee; the meandering creeks and hollers of Kentucky. I think of that “Man of Constant Sorrow”, and having a picnic on “Good Ol’ Rocky Top”. 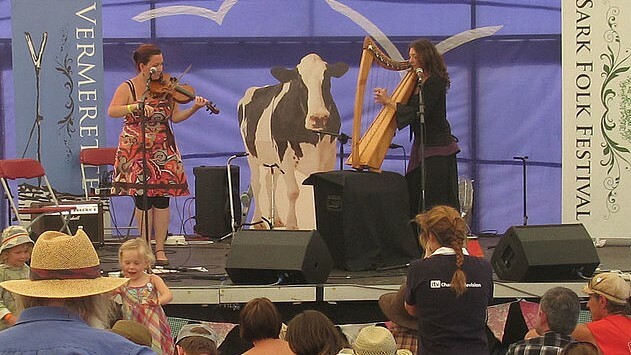 Almost like… performing with a cow onstage, ya know? So if I’m recording in the studio, and I want to put microphones on a mandolin for that more Bluegrass timbre, I won’t pick up my Ovation. It’s too modern-sounding. As one guy online put it: “There is no high lonesome quality to the Ovation.” I would agree. I’d pick up my all-wood mandolin. Is that a bad thing?? No, not at all. It’s horses for courses. Live, for example, I have never used my wooded mandolin yet. 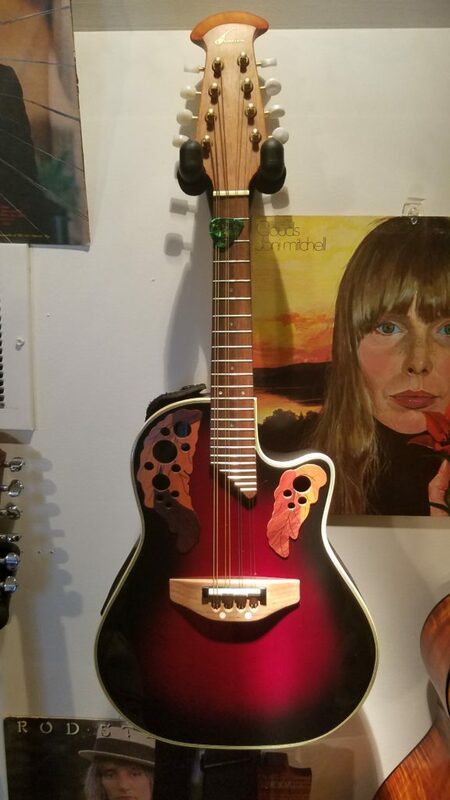 It would be too prone to feedback, for one thing, but it also doesn’t cut through the mix of a loud, full, electrified band anywhere CLOSE to my Ovation. I still use my Celebrity in the studio. If I want a more modern voice, say; or if I want to send it through my amps, or effect loops… the Ovation is killer for that. I have no complaints at all against it acoustically, But sometimes, yea… I might want to go woody. So if you’re ever hired to produce a soundtrack for “Deliverance, the Sequel”, then, by all means, go wood! You won’t get hate mail then by Bluegrass traditionalists who love to criticize the Ovations, or be tazed by the Bluegrass Police after playing an Ovation live at your local country Folk Festival!! But otherwise, yea… mic up that Celebrity. It’ll give you a really pleasing sound. And, of course, if you’re playing amplified live in loud places, well… I don’t know that you’ll find a better fit than an Ovation. It was designed to shine in acoustically-hostile environments. Ever tried to tune a standard mandolin in a loud venue?? Their nearly indestructible, rugged design. 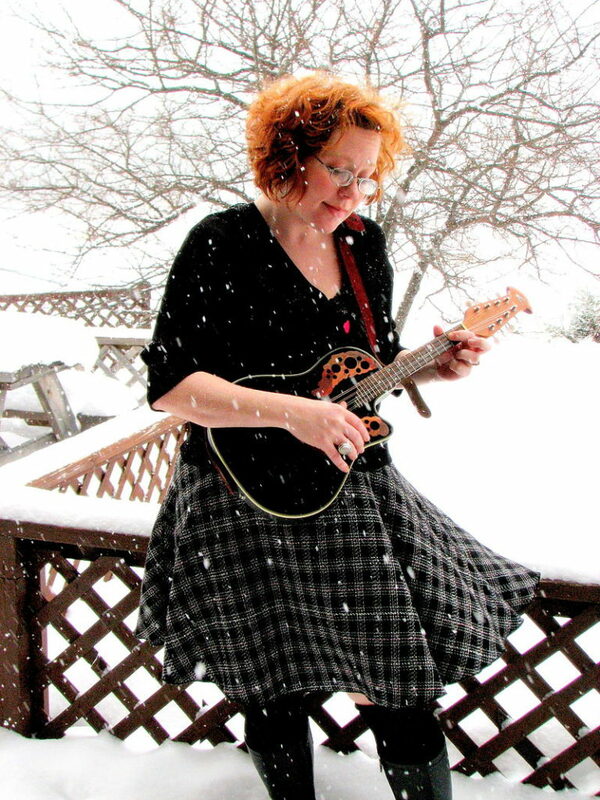 Anathea Utley playing her Ovation mandolin… which is probably STILL in TUNE!! 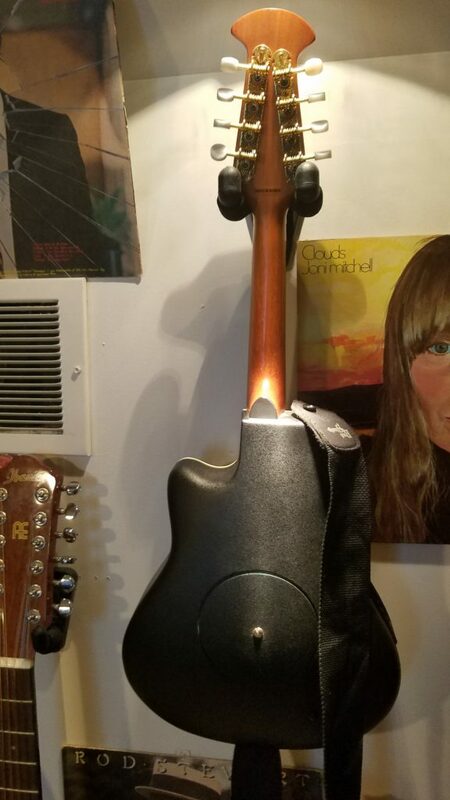 Once properly set up (as any instrument should be), the bridge doesn’t move out of place, the neck is entirely immobile, the tuning rarely goes out, and if it does it’s just a smidge… the Celebrity and MM68 models are really rock solid and an excellent choice for demanding tour & performance instruments. I can vouch for that personally, as I’ve never broken a string on this axe, and I’ve played shows months apart and when hitting the stage, most of the strings on it need little to no adjusting whatsoever. How many instruments can you say THAT about??! Gettin’ Loopy, or Havin’ a Ball? 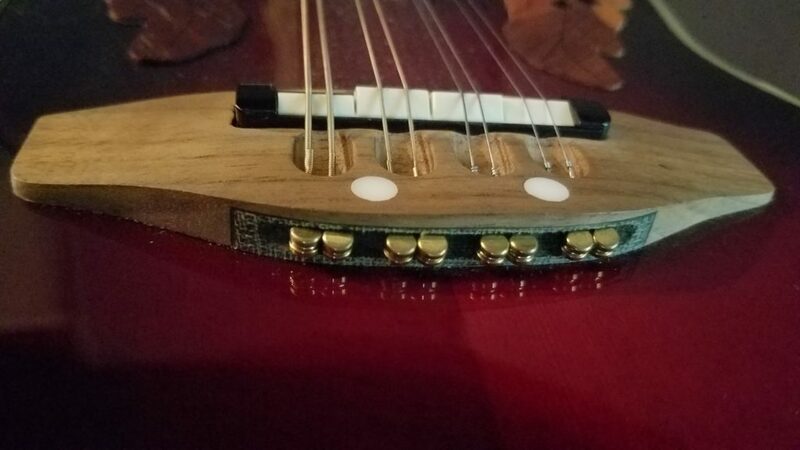 I have to also mention this, for those who ARE familiar with mandolins and their constituent parts: they use BALL-END strings, not loop-end. Is this a downside to the instrument?? I’ve never thought so. Ovation has three different sets available for us, and at least one other manufacturer makes ball-end mandolin strings too, so availability is never an issue. You can also make ball end strings out of your favorite loop ends, if you find it’s an issue somehow. It’s not too hard. But for me, the ball end strings are so much more fast and easy when I need to change strings. I MUCH prefer it to the loop end approach. The OP24+ preamp and controls loaded into the Celebrity work very well, both on stage and in the studio. I’ve never heard any crackling or pot noise in all the 5+ years that I’ve owned it. Considering I bought it used and it’s probably over EIGHT years old, that says a lot. The VOLUME & EQ sliders do what I expect it to, and delivers, and the affords me more than enough versatility to get the “Line In” tone I need for any session or live mix. It’s got three EQ bands to manipulate: Bass, Mid & Treble. 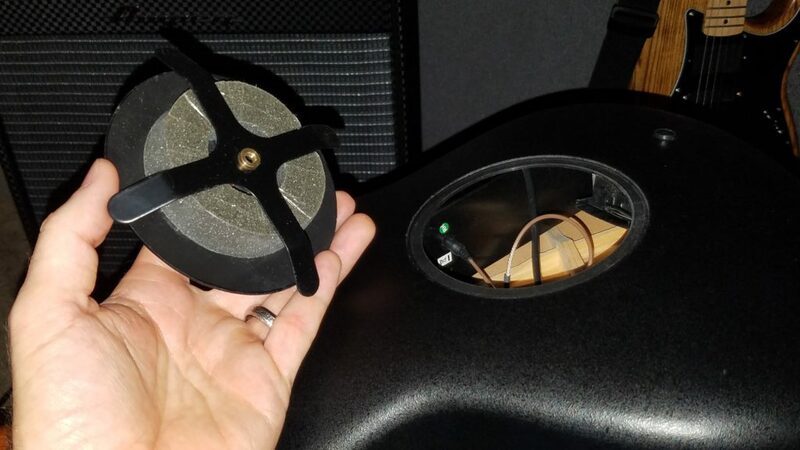 For each frequency band you get 23 dB of cut or boost to shape your tone. The “Status” button places the EQ in, or out, of the signal completely. The Celebrity electronics from the inside. 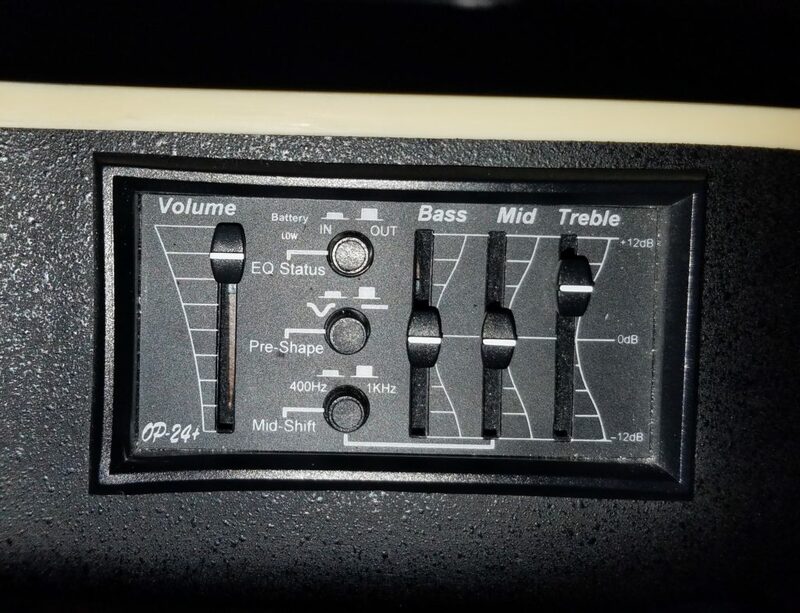 The “Mid-Shift” button allows you TWO center frequency points (400Hz or 1KHz), of two different frequency bands, that you will cut, or boosted, with the “Mid” EQ slider. The Pre-Shape button engages a circuit that attenuates the Mid frequencies, which thus boosts the bass and treble frequencies. This is a great choice if you want to reduce “rumble” frequencies below 40Hz, for example. 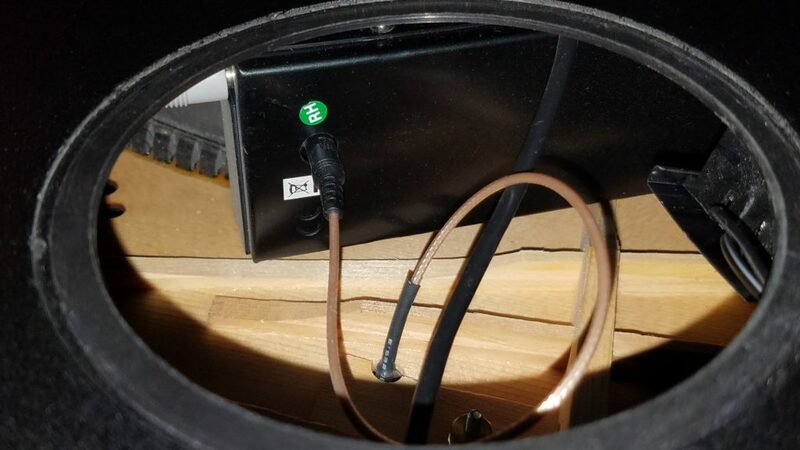 At the same time, it doesn’t come across unnatural or machine-like while amplifying my playing; it’s warm-sounding and a real asset to the instrument. Good to the Last Strum! 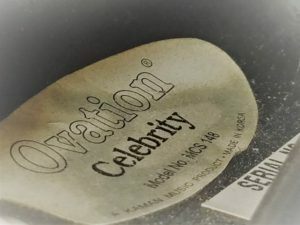 I guess to sum it up, I’ll just put it simply: the Ovation Celebrity Mandolin is rugged, dependable, has great action, an excellent reputation and, above all, a superlative amplified sound. If you want to initiate a strong, long-lasting case of G.A.S. (and how doesn’t?! ), hop over and take a look at the incredibly mesmerizing woods, detailing and colors of Ovation’s latest instruments on their MANDOLIN PAGE HERE. Those of you wanting to join me in strumming a Celebrity model, which is NOT currently in production, fear not! There’s still plenty of ’em out there, at crazy-good prices, in the used gear forums. Here’s two pages of options for ya HERE and HERE! In the meantime, put on your favorite down-home tunes and get pickin’ and grinnin’. And don’t let those Traditionalists get to ya – there’s more than one way to strum a jig!